I came across this quote in a Daily Wisdom email from Darren Main, a Yoga and Meditation Instructor and Author. I had the pleasure of taking his weekly yoga class while living in San Francisco a few years ago. The venue was incredible – Grace Cathedral! I loved how the sun setting light illuminated the stained glass windows. We practiced in the labyrinth surrounded by statues, candles, music and devoted yogis. A very special experience and a memory I will have with me forever. Now onto the quote! At first you make think that to keep your balance, one must be still. However it is just the opposite. When riding the bicycle, one must be engaged, focused on pedaling forward and steering to stay upright. Similar to balancing poses in yoga – concentration is necessary as well as engaging your muscles to remain in the pose and also relaxing into it. Focus and Breathe! Cycling has been a joy throughout my life. Even though we have not been as active on our bikes recently, preferring hikes and runs, both my husband and I have had many adventures on 2 wheels. From neighborhood rides through Pasadena, the 50 mile annual Ensenada to Rosarita ride in Mexico, our many week long rides with Backroads throughout Utah’s National Parks, the Canadian Rockies, the San Juan Islands, and many many more. A great way to not only get exercise, but to see the world. To start every ride, we have to get up on the seat and pedal! Shift gears as necessary whether going up hills or down, stop for lights, cars, pedestrians, and identify the best path to take to get us to our destination. And try to look around and take in the beauty. Just remember to pull over when you want to take a picture! In life, we also have to get up and go – instead of pedaling we use our 2 feet. We pick up or decrease the pace based on the circumstances around. Are we rushing to catch the train, be on time for work, meeting a lunch date, or just enjoying a leisurely stroll. Sometimes detours along the way bring us more interesting experiences and new adventures. Sometimes we fall or get a bruise, but with determination and commitment, we get right back up. We know that to succeed we keep going, keep moving, just like on the bicycle. 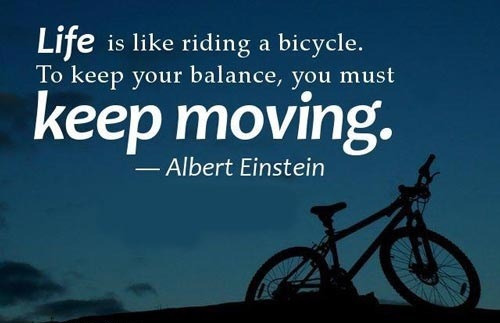 Enjoy your ride and keep moving! ← Birthdays – It’s not about the Cake!